She wanted something sewing inspired so I used the 'how to sew a pillowcase' text print and made some mini spools. I hope she likes it! Everything in this group is so cute so far but no peeks of my medallion have gone up yet! Linking up to Show and Tell Tuesday so I can check out everyone else's WIPs! 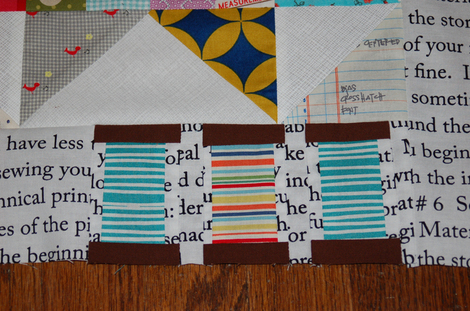 What a great idea to use the stripe print for the thread on the spools. Cute! Are you going to show us more of that awesome quilt? This page contains a single entry from the blog posted on June 11, 2013 8:46 AM. The previous post in this blog was Green Smoothies, Essential Oils, and Quilt Blocks. The next post in this blog is Heather Ross Scraps and an Almost-Finished Top.